IDEAS WANTED! Have some creative solutions to enhance the campus support to students with Special Educational Needs (SEN) and want to voice them out? Have an awesome idea in mind to promote the awareness of SEN and want to make it real? 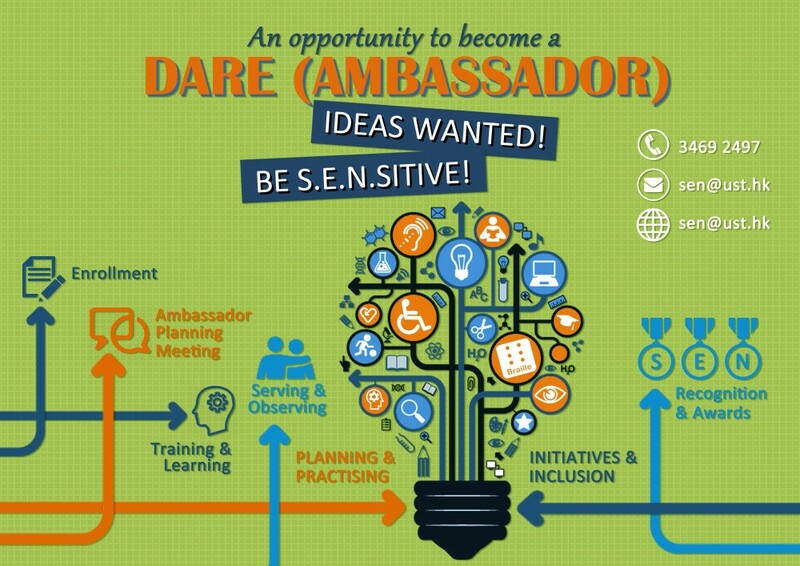 DARE stands for DiversAbility, Advocacy, Resources and Equity. The program aims at recruiting a group of enthusiastic students who want to empower the HKUST campus community to positively impact the support to students with SEN. The role of the ambassadors is to cultivate a campus where everyone’s diverse abilities are appreciated and where everyone feels accepted and nourished. No matter how much you know about SEN, where you are from, and who you are, you can be part of the program if you want to contribute to campus inclusion!